Titanium is the preferred material for surgical fixation procedures ranging from knee replacement to jaw implants. However, since this super-strong metal is not absorbed by the body over time, it can cause complications like infection, fistulization (particularly following radiation therapy), interference with skeletal growth, intolerance, thermal sensitivity, and interference with MRI and other imagining procedures. Additional procedures to remove hardware are among the most common surgeries worldwide and a major cost for hospitals. A promising alternative is magnesium, a safely biodegradable metal and cofactor for many enzymes in DNA repair that also promotes bone health. But while its physical properties make it suitable for load-bearing sites, such as the temporomandibular region of the jaw, its rapid breakdown in the body sometimes results in the formation of hydrogen bubbles that can lead to serious complications. 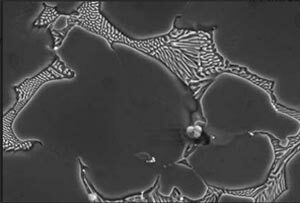 In a unique collaboration, researchers at the NYU Tandon School of Engineering, NYU School of Medicine, and NYU Dentistry are developing and testing alloys of magnesium that are treated to improve strength and slow down the degradation process, thereby avoiding the formation of these bubbles. In research published in the Journal of Cranio-Maxillofacial Surgery, the team, which includes Nikhil Gupta, associate professor of mechanical and aerospace engineering at NYU Tandon; Paulo Coelho, the Dr. Leonard I. Linkow Professor at NYU Dentistry; Eduardo D. Rodriguez, Helen L. Kimmel Professor of Reconstructive Plastic Surgery and chair, Hansjörg Wyss Department of Plastic Surgery at NYU School of Medicine; and Andrea Torroni, MD, associate professor, Wyss Department of Plastic Surgery at NYU School of Medicine, reported on their tests of a magnesium alloy that was subjected in Gupta’s lab to a process called T-5 tempering, involving heating at 210 degrees Celsius for 48 hours. After surgically implanting small samples of the alloy in the fronto-nasal region of study animals, the team examined the accumulation of the element in the lymph nodes, finding no difference between animals with no implants and the study animals. The researchers also implanted untreated — or “as-cast” alloy, finding that both the as-cast samples and T-5 heat-treated alloys showed good biocompatibility and promoted bone growth in test animals. The T-5 alloy, however, was much more stable, with an eight-fold lower degradation rate than the as-cast alloy. Gupta said he was not surprised by the positive results, as they mirrored what he had observed during in vitro studies at NYU Tandon. The team also discerned no post-surgical morbidity, even in the control animals that received implants of untreated magnesium. “Because of magnesium’s systemic absorbability, this is not a problem,” said Coelho. “The key idea is to make an implant that can be either non-absorbable, as a permanent support, or absorbable, like sutures that go away after some time.” Gupta said that the research would not have been possible without collaboration between NYU institutions. “The breadth of this research takes it from the lab all the way to a clinical setting,” he added.